Doctors and nurses last month protested over heavy workload, poor overtime pay, lack of help with administrative work, and overcrowded hospitals, among a litany of other issues. Hong Kong’s medical system was at a “bursting point,” and they could not keep silent any more, the doctors and nurses said at the rallies. The situation becomes particularly severe during the annual influenza season, they said. Responding to the issue, Chief Executive Carrie Lam said an extra one-off HK$500 million had been reserved for the Hospital Authority to help tackle the winter flu surge. But medics have questioned whether additional funding will truly help with the situation. What is the winter influenza season? On January 2, the Centre for Health Protection announced that Hong Kong had entered the winter influenza season, a week earlier than last year. The timing is determined when the positive percentage of seasonal influenza viruses tested in samples reach a baseline level set on the basis of averages in years past. Children, elderly people and patients with chronic diseases are most susceptible. By the end of January, more than 120 people had died because of the influenza outbreak, one of them a two-year-old child. Why are doctors and nurses protesting? According to daily occupancy rate statistics released by the Hospital Authority during the winter surge, at least ten public hospitals were over-capacity on any one day. Officially, the bed occupancy rate may be as high as 130 per cent at some hospitals. But nurses have publicly questioned the official data, saying that the rate could be as high as 150 per cent. 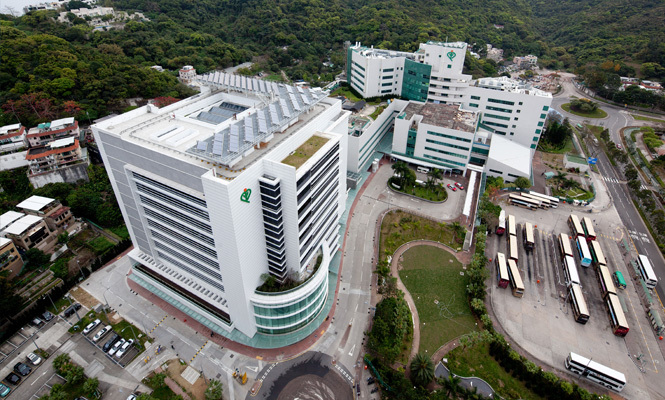 Tseung Kwan O Hospital reached 130 per cent bed occupancy rates on three consecutive days in January. File Photo: Hospital Authority. Medical sector lawmaker Pierre Chan said doctors had to spend too much time on administrative work, instead of treating patients. 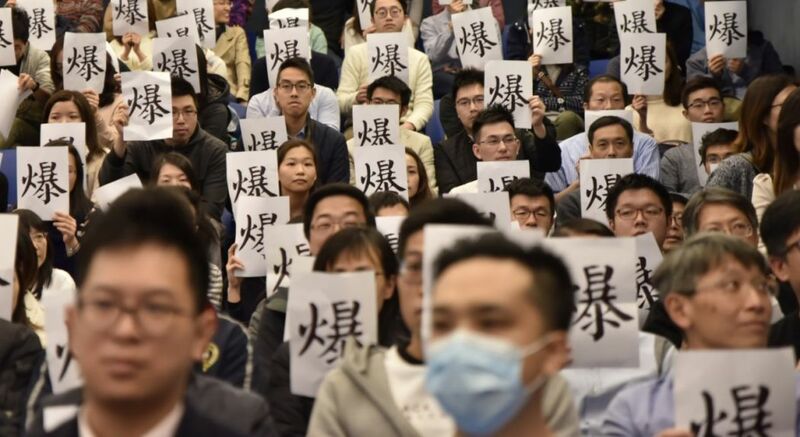 Wong Lok-yu, a doctor at Queen Elizabeth Hospital’s emergency room, said at a January rally that management-level doctors at the hospital often spent their time conducting meetings and discussing issues such as the construction of the Kai Tak Hospital, now in progress. “Management level doctors should stop non-emergency administrative work,” Wong said. The rate of an overtime pay scheme for public hospital staff members has also been criticised for being lower than the normal salary on offer. The Hospital Authority increased it by ten per cent temporarily in response. Why were the government and the Hospital Authority criticised? 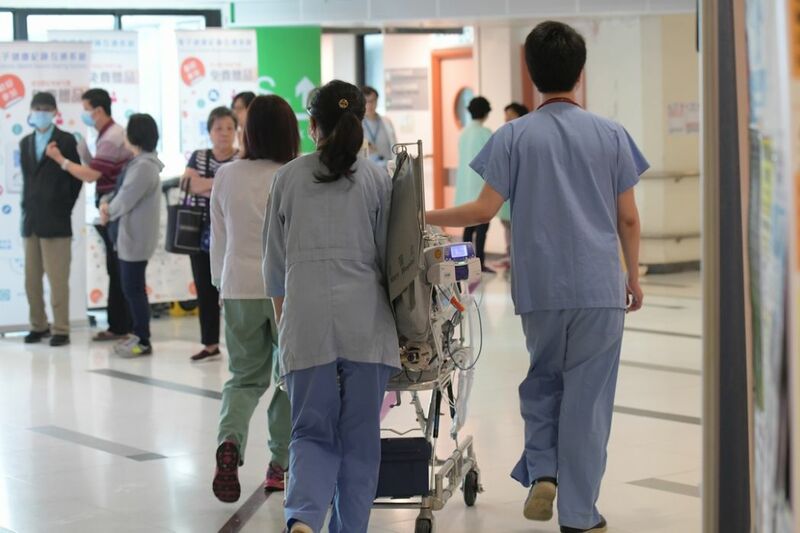 An outcry was sparked when Secretary for Food and Health Sophia Chan said on a radio programme in mid-January that she respected medical professionals, who helped out on holidays “out of loyalty to the service.” Nurses accused Chan of “morally blackmailing” them. The Hospital Authority also produced six videos with celebrities intended to “cheer up” medical professionals. But it halted plans to produce more following a backlash. A “snack day” was held at the Tuen Mun Hospital on the afternoon of January 10 to cheer on hospital staff members, offering free siu mai, fishballs and other snacks. But it was criticised by doctors as wasting resources instead of improving medical services. 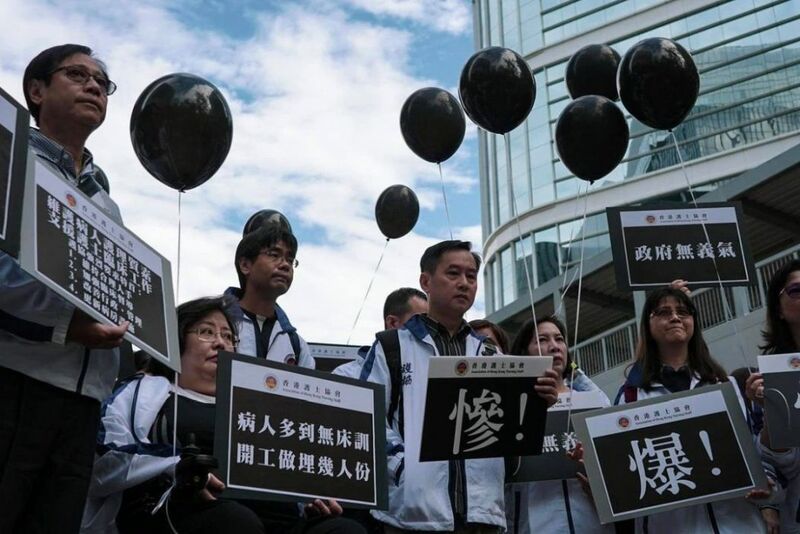 “We don’t even have time to eat full meals, and [the Hospital Authority] told us to eat fishballs and siu mai – are you joking?” Tuen Mun Hospital cardiologist Alfred Wong said at the January protest. Wong added that staff members had to bring their own utensils for environmental reasons. 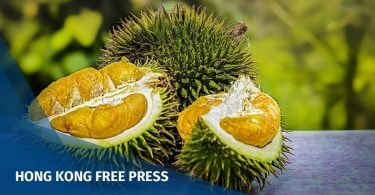 “Should I take knives and forks to wards, and skip my meal for fishballs and siu mai after inspecting wards?” Wong asked. 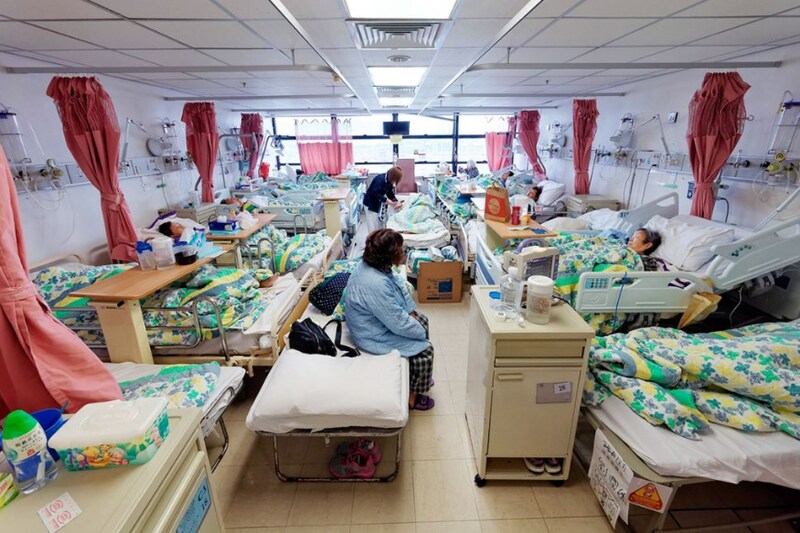 Wong also urged the Hospital Authority to stop asking medical professionals to attend courses on national affairs in the mainland while the winter flu surge overwhelmed local facilities. Both Chief Executive Carrie Lam and Secretary for Food and Health Sophia Chan gave no clear details about the extra HK$500 million, despite demands from nursing sector lawmaker Joseph Lee. 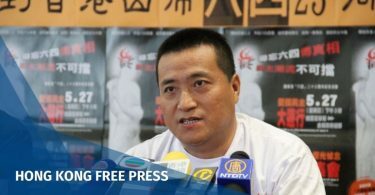 Chan said at a press conference that the Hospital Authority would review demands from medical professionals, such as reducing administrative work, increasing night-shift manpower and updating equipment and resources. Chan said there would be new, regular HK$190 million funds made available for the 2019 school year to increase the vaccination rates of students. The government will also subsidise five local studies on the flu. Previously, Chan promised there would be 60 more places for medical students every year. Flu vaccination at a kindergarten. File Photo: Apple Daily. Why can’t the government simply hire more staff from overseas? The hiring of medical staff is conducted by the Hospital Authority. In recent years, it has rejected applications from the majority of foreign doctors because they were not fluent in Cantonese. Liberal Party lawmaker Felix Chung had said that the government should consider allowing children of Hong Kong people, who have studied medicine overseas, to come back to the city to work as doctors. But Chief Executive Carrie Lam said the government would not propose allowing doctors qualified elsewhere to work in Hong Kong before a consensus was found within the medical sector, otherwise it could spark another controversy. 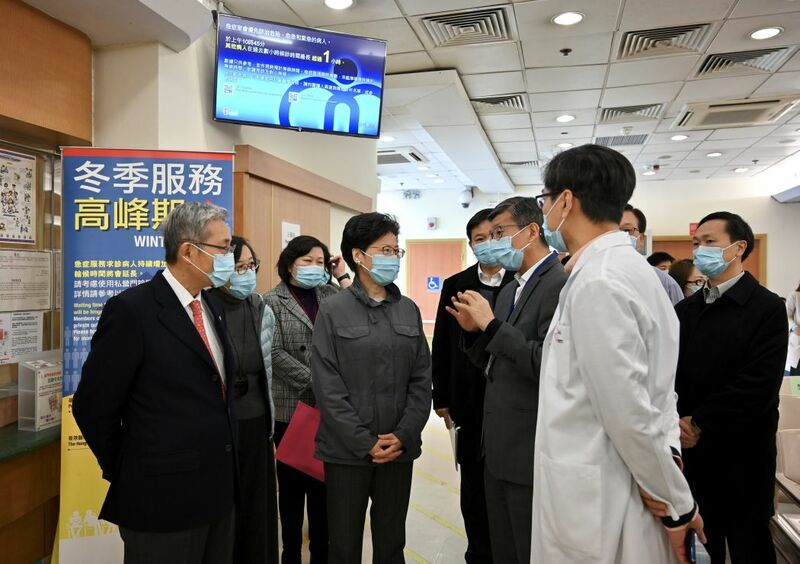 Chief Executive Carrie Lam visiting Tuen Mun Hospital on January 1, 2019. Photo: GovHK. What are the other suggestions? Tuen Mun Hospital doctor Alfred Wong has said that the government should not only consider one-off extra funding but also increase the recurrent expenditure since the winter influenza surge is an annual issue. “We have HK$500 million this year, but we are not sure if the funding will be there next year. So how do we hire more people?” he asked on his Facebook page. Wong suggested reintroducing the system which was in place before the 1997 Handover which allowed doctors from British Commonwealth countries to practice in Hong Kong. They were trained under the same system as local doctors. The suggestion was supported by Hospital Authority former chair Anthony Wu. He also said the government should cut down on the one-way permit scheme, under which 150 people a day can move to Hong Kong from the mainland – more than 50,000 per year. The Hong Kong government has no power to vet who can come under the scheme. He said the increase of 60 more medical students each year would not keep up with the population increase. “Should the 60 students each take care of 1,000 patients?” he asked.